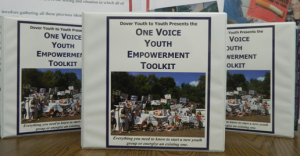 Representatives of Dover Youth to Youth are highly sought after to provide workshops at conferences; youth advocacy training to local groups, or presentations in schools. Youth Advocacy/Empowerment training for youth or the adult advisers that work with youth advocates. However, much of our training is customized to the needs of the requesting agency. Consequently, if you have a training need not listed on that page, it never hurts to call and see if it is something we can accommodate. You can be assured we will not try to teach a topic where it is not our area of expertise.